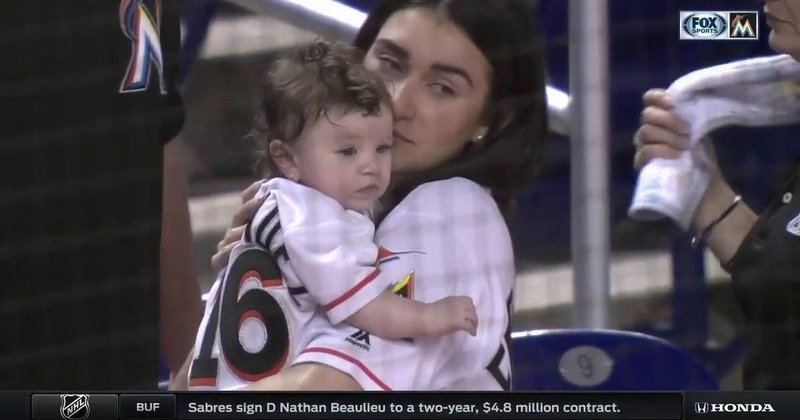 MIAMI (AP) — Second baseman Dee Gordon carried Jose Fernandez’s 5-month-old daughter Penelope across the Miami Marlins clubhouse, and when they stopped at her late father’s locker, she began to cry. There were tears and smiles and hugs and mixed emotions Monday as Fernandez’s family visited Marlins Park for a game for the first time since the All-Star pitcher was killed in a boat crash last September. Monday would have been Fernandez’s 25th birthday. The family visitors included Penelope’s mother, both of her grandmothers and Jose’s grandmother. The family went onto the field before batting practice and stayed for the start of Miami’s game against Washington. Rojas said he saw Penelope’s resemblance to her father. “Her face and her hair — I remember a lot of mornings Jose would come in with messy hair,” Rojas said. Manager Don Mattingly agreed the family’s visit tugged on the heartstrings.